The GHC will publish the posters on our website and on ActiveHistory.ca as they are completed. We also plan to create a traveling pop-up people’s history exhibition this summer. Learn more about the project on our new website, and stay connected with us on Facebook, Twitter, and Instagram for news and special features. Under the UFA, Yukon First Nations now have various administrative and law-making powers that they can exercise on their settlement lands. Once the purview of the Indian Act or the territorial government, control over citizenship, education, health, and justice now falls under Indigenous jurisdiction. In contemporary Indigenous politics, some consider this granting of rights as an unprecedented victory. 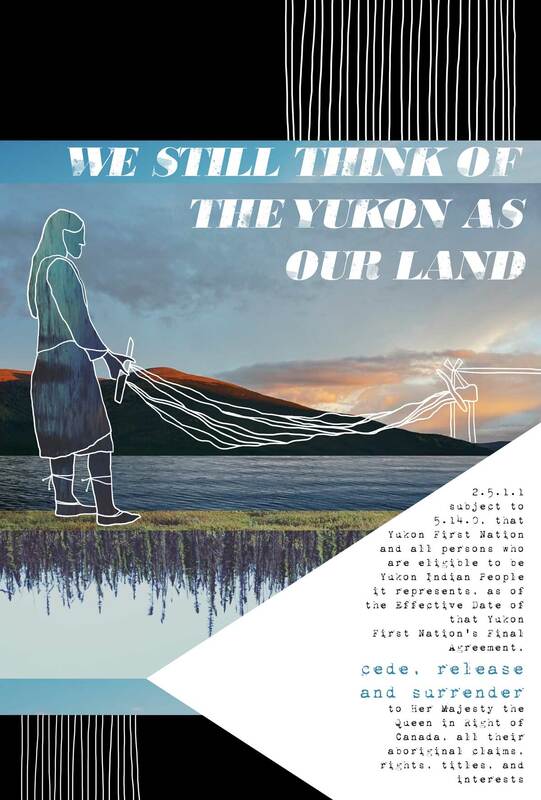 The UFA is celebrated by many for extending a series of significant jurisdictional powers to Yukon First Nations; however, negotiating with the settler state and signing land claims and self-government agreements under the UFA came at a steep price. As part of the agreement, Canada included a “cede, release, and surrender” clause (the exact language appears on my poster), which means that in exchange for the state granting Indigenous peoples certain powers and law-making abilities on settlement lands (8 percent of the territory), First Nations must also “cede, release, and surrender” their rights to the remainder of their traditional territories. This land is now referred to as non-settlement land and it is largely controlled by the state. It is mapped, surveyed, named, renamed, divided up, mined, sold, leased, developed, toured, explored, and claimed by settlers. Lianne Marie Leda Charlie is a descendant of the Tagé Cho Hudän (Big River People), Northern Tutchone speaking people of the Yukon. She is the granddaughter of Leda Jimmy of Little Salmon River and Big Salmon Charlie of Big Salmon River on her dad’s side and Donna Olsen of Denmark and Benjamin Larusson of Iceland on her mother’s side. She was born in Whitehorse, Yukon to her mother, Luanna Larusson, and late father, Peter Charlie. Lianne is a Political Science instructor at Yukon College in Whitehorse, Yukon, and she is currently pursuing a PhD in Indigenous Politics at the University of Hawai`i at M?noa. Lianne’s work is also on display on Instagram. Alcantara, Christopher. Negotiating the Deal: Comprehensive Land Claims Agreements in Canada. Toronto: University of Toronto Press, Scholarly Publishing Division, 2013. Coulthard, Glen Sean. Red Skin, White Masks: Rejecting the Colonial Politics of Recognition. Minneapolis: Univ Of Minnesota Press, 2014. Irlbacher-Fox, Stephanie. Finding Dahshaa: Self-Government, Social Suffering, and Aboriginal Policy in Canada. Vancouver: University of Washington Press, 2010. Nadasdy, Paul. Hunters and Bureaucrats: Power, Knowledge, and Aboriginal-State Relations in the Southwest Yukon. Vancouver: University of Washington Press, 2005.